Pat’s theme this year, 'Let’s Go Camping!' has inspired us! We’d love to know where your first/next camping trip will be, tell us in the comments, maybe we’ll see you at the campground! Block number six is Food, Food, Glorious Food! Camping works up an appetite and food just tastes better when you eat outside. 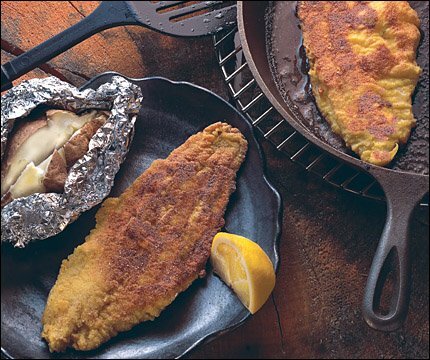 Many of you have camping food traditions. Or you might be starting out camping and want to soak in all the nuances of cooking outdoors. We are ‘Stirring the Pot’ this month and I took a look around to see what are a few unique and ‘new to me’ camping food traditions. First up is a ‘Shore Lunch’. I had never heard of this, what the heck is a shore lunch? Polling my friends who fish in Minnesota, here is what I learned. When you go fishing with a guide, at lunch time the guides will build a campfire. Everyone that has gone fishing relaxes on the shore, while the guides prepare and cook the fish that you caught for a tasty lunch. This sounds fun! I’ve never gone fishing, but it’s a camping basic for so many. Have you done a Shore lunch? • Hotdogs on a stick, and you have to find your own stick! Now let’s shift to ‘my world’ of camping with a bit of urban tailgate party throw into the mix, because if we are glamping we have access to a lot more tools! • and any other thing you can think of when you have a fridge and oven available! NEXT MONTH, JULY, will be my Setting directions. Then we can start creating our quilt as the last blocks are released. 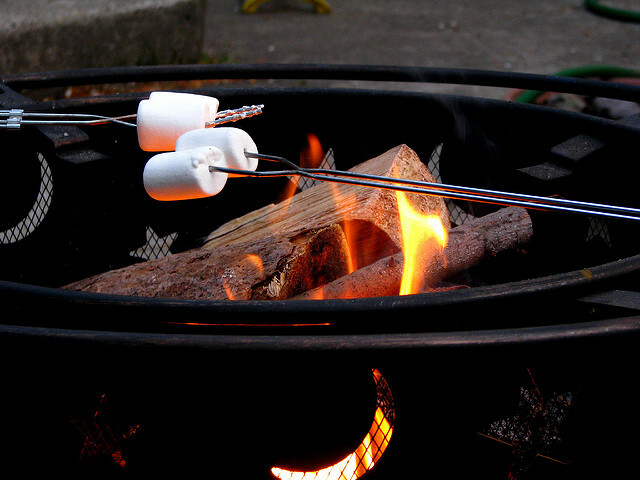 Do you have a favorite activity you do while camping? Perhaps something unique your family created? We’d love to hear it, tell us in the comments! 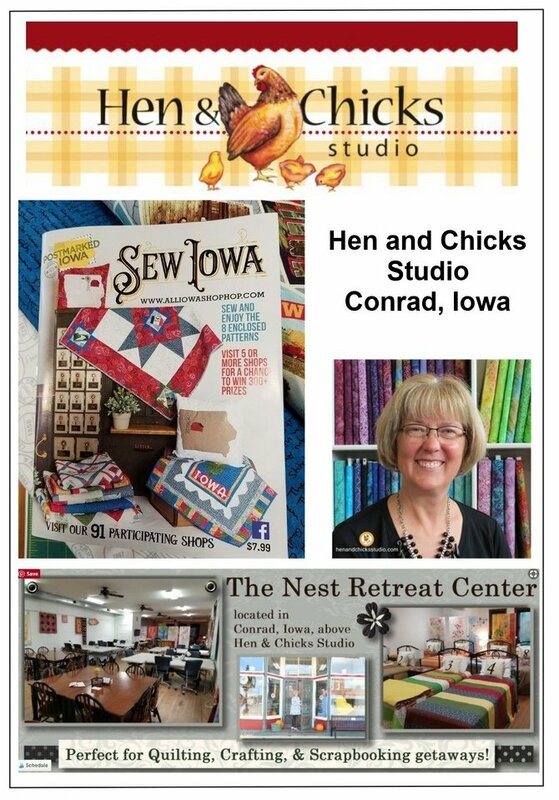 Hen & Chicks Studio has been providing the Conrad, Iowa, community with a delightful selection of fabrics, notions, and scrap booking supplies since October 2011. The business also houses a fully-equipped retreat center where quilters and scrap bookers of all skill levels can enjoy a wide range of classes, clubs, and social events, as well as reserving the retreat center for special gatherings such as girlfriend getaways or family parties. After a 25-year professional quilting career, and nearly 40 years of crafting, owner, Heidi Kaisand, decided to combine her experience and passion for inspiring creativity in others into a new business venture. 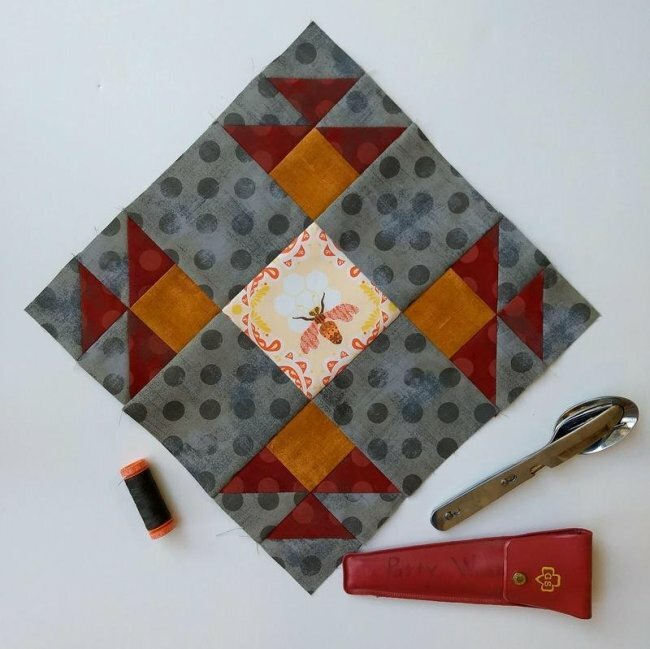 Heidi indulges her creative spirit at Hen & Chicks Studio by helping individuals and groups succeed at quilting, scrap booking, and other art forms. When Heidi's not working, she loves to spend time with her family, fishing, golfing, and gardening...squeezing in sewing and scrap booking as often as possible in between family activities. We carry all kinds of fabric, threads, notions, patterns, books and other sewing and quilting items. We offer classes in quilting and sewing for beginners to advance person, children and adults. Are you loving our camping theme this year? Leave me a comment below telling me about your favorite camping foods or snacking activities!